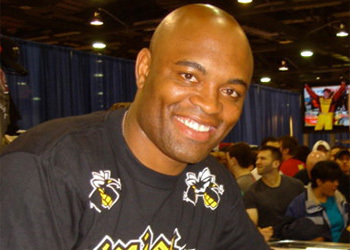 Leading up to UFC 117, middleweight champion Anderson Silva has been letting Chael Sonnen do much of the talking while he looks to bounce back from what transpired in his last outing at UFC 112 in April. “The Spider” understands Sonnen is doing his best job to hype the fight, but also wants his challenger to know that many before him have tried to get into his head to no avail. In fact, the last 12 fighters to stand across from him have come up short. Following what UFC president Dana White described as an “embarrassment” of a main event in Abu Dhabi, the brash promoter granted Sonnen a shot at the title following his lopsided upset over Nate Marquardt at UFC 109. In Sonnen, Silva will see an in-your-face type of fighter that he hasn’t confronted in his most recent title defenses, which is something that might play right into Silva’s hands. “I’ll go in there and do my job, as he will,” Silva stated while sporting a sheepish grin. UFC 117 takes place August 7th from Oracle Arena in Oakland, California.